People nowadays focus more on what they are eating, rather than where they are eating. Right? As with the evolution of technology trends, people have become more health conscious and aware of what they consume. May 7, 2018, from this date, consumers got access to menu labeling, i.e. calorie and nutrition information in certain chain establishments covered by the rule under FDA. As per the above statista, you can get an idea that it has become easy for the customers to know what they are eating. 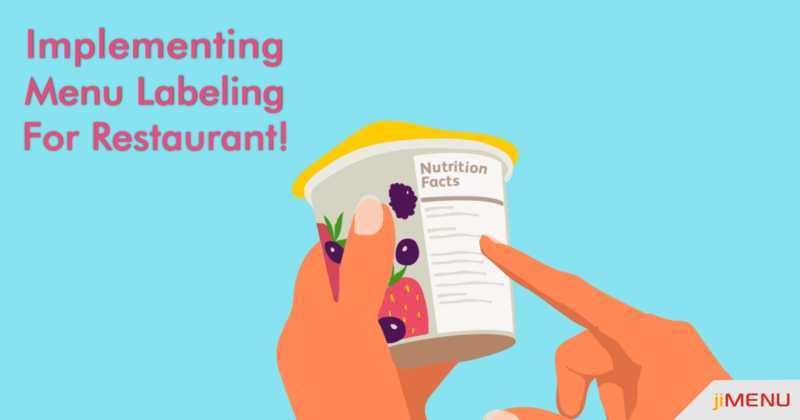 Restaurants have widely adopted the idea of menu labeling in their existing framework to make their customers aware of the nutrition level in the meal they have ordered. Labeling the menu items will make the customers gain trust in your restaurant food quality and will even let you know what you are having! So, here's a list of benefits which menu labeling will offer to your restaurant. Meet customer demands: Majority of the customers these days want to know about each and everything they eat. How many calories, fats, and other nutrients are contained in the food they are served. Getting all this information over the menu will make it easy for the customers to get an idea about what they are eating. Increase customer loyalty: Customers want to know what they are served with and how healthy is the food for them. Once your customers get aware of the nutritional level of the food they are served with, they will automatically gain trust in your restaurant and the services you offer them. Increase your profit margin: Especially for the most health conscious people, if you offer them food which has low calories and a little higher price, they would definitely go for it. This would help your restaurant in getting more profits and optimized sales. Answer your customers: People who want low-calorie food gets the detail already displayed on the menu. This would be a perfect answer to all the queries they were having in their minds till now. Moreover, this would gain their attention towards your restaurant. Benefits to the customer end! Public awareness: People have no idea that the food they love the most contains around 2500 calories and isn't good for their health. While another dish they disliked contains a high proportion of nutrients. So, getting information about all the nutrients in advance will make the people aware of what they are eating and how much healthy is it for their body. Making healthier choices: Deciding that whether a food item is healthy or not will be difficult if you aren't provided any information regarding it. Isn't it? Nor do we know that the dish we order every time contains a huge proportion of calories in it. So, getting a detailed information of the nutritional level of the food items you are consuming will help you in making more healthier choices for your body. How can jiMenu help you out? jiMenu is one such ultimate solution which offers you digital menu services at affordable prices. You can get your menu designed as per your requirements and depending on your restaurant framework. Customize your existing menu with a totally digital menu and gain a better customer base. Still confused, get in touch with us and get assistance from our team of experts!